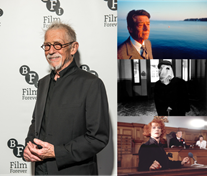 At a special memorial event on Sunday 25 June, BFI CEO Amanda Nevill announced that BFI Southbank will host a film and television season dedicated to BFI Fellow Sir John Hurt, who died in January. The John Hurt season will take place at BFI Southbank from 1 – 31 January 2018, marking one year since the beloved actor passed away. His death resulted in a huge outpouring from the public and the film industry alike, reflecting the huge love and respect in which he was held personally and professionally. The memorial event – Sir John Hurt: A Celebration – was hosted by film critic Mark Kermode, curated by Anwen Hurt and featured some of Hurt’s most celebrated moments on screen, accompanied by tributes and memories from some of the people who worked with him throughout his life including BAFTA-winning director Sir Alan Parker, Oscar-winning producer Jeremy Thomas, writer and broadcaster Stephen Fry, actors Toby Jones and Penelope Wilton and from politics and diplomacy, Cathy Ashton. Sir John Hurt holds a significant place in film history and made an outstanding contribution to British film and television during his extensive career. From his early roles in A MAN FOR ALL SEASONS (Fred Zinnemann, 1966), 10 RILLINGTON PLACE (Richard Fleischer, 1971), ALIEN (Ridley Scott, 1979) and I, CLAUDIUS (BBC, 1976) through to leading performances in THE NAKED CIVIL SERVANT (Thames, 1975), MIDNIGHT EXPRESS (Alan Parker, 1978), THE ELEPHANT MAN (David Lynch, 1980), LOVE AND DEATH ON LONG ISLAND (Richard Kwietniowski, 1997) and JACKIE (Pablo Larraín, 2016), Hurt was one of our greatest actors. We hope to include all these titles and more in the retrospective, offering audiences the chance to remind themselves of the enormous talent of the late, great Sir John Hurt.